FREE shipping will use one of the following shipping methods at our sole discretion based on the order WEIGHT and DIMENSIONS. 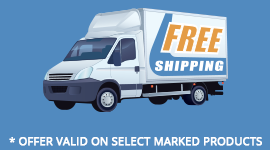 If you are selecting the FREE SHIPPING method, and your order fully qualifies, please be sure to provide both your POSTAL and PHYSICAL shipping address (especially if they differ, or if your postal address is a PO BOX). Bulk Cables (such as Cat5E, CAT6, Coax, Speaker Wire, etc) sold by the pull-box or reel, TV Mounts, Desk Mounts, and select TV Antennas are NOT included with this offer. FREE SHIPPING offer can not be combined with any other offer or promotion. Valid ONLY in the lower 48 continuous states and DC in USA. Order total must be $75 or more and only include products that qualify for free shipping offer. Should you have some NON-QUALIFYING products, we recommend you place a separate order for such products to avoid paying an extra shipping charge. Free Shipping offer MUST be selected at time of check-out. We will NOT update orders after they are submitted. Upgrades to AIR SHIPPING or other shipping methods will NOT be honored. Offer valid for website originating orders by customer only. We reserve the right to limit this free shipping offer, and to cancel it at any time without notice.